After enjoying a week playing on the beach and in the surf, we opted to spend our last day on Ecuador’s coast in Puerto Lopez, a sleepy fishing town about two hours south of Manta. It wasn’t really the town we were interested in, but a trip to Isla de la Plata (“Silver Island”). Isla de la Plata is an island 90 minutes from the mainland (by a very fast boat) and is known around these parts as the “Poor Man’s Galapagos.” Despite this name, we elected to visit the island less because of financial reasons and more because of timing (the Galapagos Islands require more of a time commitment than we had available on this trip, and we opted to spend that time playing on the beach). Isla de la Plata seemed like a good compromise, and according to my guide book, is a “reasonably accurate facsimile of one of the Galapagos islands.” It’s also home to several bird species, including blue-footed boobies, red-footed boobies, frigate birds, and albatross. Given my long history with sea sickness, I was a little nervous about the boat ride, but after taking tablets well in advance, I found it to be surprisingly enjoyable. About an hour into the journey, there was a thrum of excitement on the boat—the captain had spotted a pod of humpback whales in the distance. Everyone quickly agreed to postpone our arrival to the island for a chance to see these beautiful creatures. After the boat circled around to approach the pod from a better angle, we settled in and waited, rocking to-and-fro with the waves. Soon thereafter, there was an audible intake of breath from all aboard. Fins broke the water’s surface as these large, but supremely graceful creatures undulated just beneath. Then, we spotted a pair of fins rising and falling as two whales rolled their bodies in tandem, making it look as though they were not swimming, but dancing a carefully choreographed underwater ballet. And then there was a collective gasp—a whale took a glorious leap skyward, momentarily joining us in the open air. This entire sequence repeated several times, leaving us all breathless. I believe everyone would have been satisfied with the trip after this unexpected delight, but we finally moved on toward our intended destination. As we disembarked from the boat to set foot upon the beach of Isla de la Plata, I took note of several species of birds that were immediately in sight—frigate birds flying high above, and curious mockingbirds and Darwin’s Finches landing nearby to check us out. 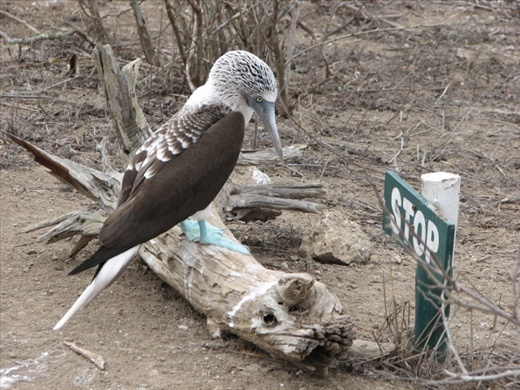 The bird I most wanted to see, however, was the blue-footed boobie. We didn’t have to wait long, for just after 15 minutes of hiking, we came upon the first boobies—a mating pair with the male nesting upon newly laid eggs. Shortly thereafter, we couldn’t avoid these birds if we tried. It was surprising how unconcerned they were with our presence, especially considering that they live on a deserted island surrounded only by other wildlife and the occasional daily visit from small groups of tourists. Some of the birds even built their nest directly on the hiking path and made no effort to move as we drew near—and why should they? This is their island, not ours—so I was pleased to see that we were forced to avoid them and not the other way around. After hiking for a few hours and seeing more birds than I could have hoped for, we returned to the boat to make our way back to the mainland. Just as we all reboarded, we spotted sea turtles paddling around the boat (and hoping for some food, no doubt). Seeing them was a lovely end to a lovely day.